In late 2010, Transit Action Network initiated and led a campaign to restore transit funding from the Public Mass Transportation Fund (1/2-cent city transportation sales tax). We were successful in getting Ordinance 100951 passed. The Ordinance increases the share of revenue going to the Kansas City Area Transportation Authority back to the 95% level it received before voter approval of the 3/8-cent transit sales tax in 2003. Full implementation to 95% is due in the budget for FY 2014-2015, beginning May 2014. In 2010, KCATA was receiving only 74% of the ½ cent sales tax. The ordinance has three years to be fully implemented. From 74% to 95% is a 21% increase. Over the three years of implementation, that would be 7% per year if increased in equal amounts. 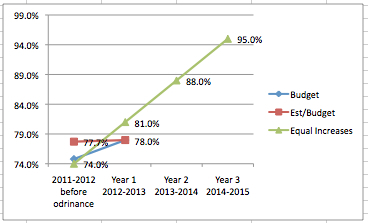 One year has passed and KCATA currently receives only 4% more than in the pre-100951 budget. The city is working on the second budget (FY 2013-2014) and we would like to see KCATA receive closer to 88% of the Total Available Resources. That would be 14% higher than when the ordinance was enacted and would represent a more consistent phased increase. Percentage equals Pass Through Payments1 times 100 divided by Total Available Resources. 1This is the amount KCATA receives, see budget page. This entry was posted on November 16, 2012 at 9:38 AM	and is filed under Local Transit Issues. Tagged: Kansas City, KCATA, KCMO2013-2014budget. You can follow any responses to this entry through the RSS 2.0 feed. You can leave a response, or trackback from your own site.